Wobble Stool is the perfect chair for active sitting. It creates a healthier sitting environment by moving with you throughout the day - safely rock, swivel, tilt, lean and burn calories while sitting. It's the PERFECT Standing Desk Stool - adjusting high enough to let you ""perch"" near standing height, making the move between sitting and standing fast and effortless. - BALANCE STOOL: Wobble Stool’s patented base lets you sit still or gently rock, tip, twist, lean and swivel 360. 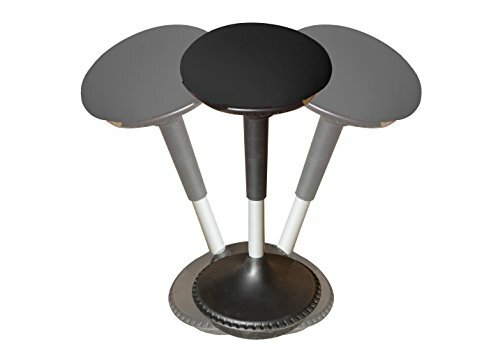 Move more and sit actively with this unique balance stool. - STANDING DESK STOOL: Wobble Stool is height-adjustable from ~23-33”, extending high enough to let you “perch” near standing. It makes an excellent adjustable-height stand up desk stool that’s quick to sit on and easy to get up from. - COMFORTABLE: We engineered the 3”+ thick seat cushion for optimal comfort. It’s made of premium molded foam, waterfalls over the edgeless seat frame, and is covered with a premium fabric for a cool, comfortable seat. - PATENTED ROUNDED BASE makes it easy to rock, swivel and move around while sitting. You don't need to be in constant motion or balance because the special base design allows you to sit comfortably in a stationary (non-balancing) position. - TALL ADJUSTABLE HEIGHT RANGE Wobble Stool adjusts from 23-33"" tall, letting you sit higher and stand up more frequently during the workday. - NON-SKID BASE securely grips most floor surfaces including carpet, wood, tile. PERFECT STANDING DESK STOOL: Supports your weight, takes the load off your legs and gives you a rest from standing by letting you perch. The best office stool for your stand up desk!